Welcome to 1-888-NO-UNION.COM, the internet's most comprehensive source for employers and employees who wish to remain or become union-free. 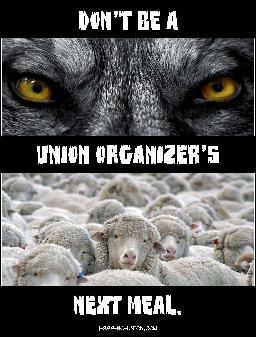 THAT UNIONS CAN LIE TO THEIR OWN MEMBERS! What is a Union Mole? � What is a union? � What is a union authorization card? � Can I decertify a union in my workplace? � Can I be forced to pay union dues? � Can I lose money with a union? GO HERE TO GET IT ANSWERED. All information and materials on 1-888-NO-UNION.COM are free. The information and materials on this site are for informational purposes only. Nothing on this website constitutes, nor should it be viewed as legal advice or advice to either employees or employers. Moreover, the information provided on this site should NOT be construed as advice for employees on how to exercise your NLRA Section Seven Rights. If you have a legal question, you are strongly encouraged to consult with your attorney (as an employer) or contact us should you need a referral to legal counsel. Further, should you request an answer to a question, you agree that any answer to any question does not constitute legal advice, or advice of any nature, but is purely for informational purposes. Copyright. 1-888-NO-UNION.COM, LLC. 2009. All rights reserved.